The founder of the Waterstone's book chain has withdrawn a £280m ($501m) offer to buy back the business from its current owner, HMV. Tim Waterstone said the conditions imposed on his consortium were too punitive and that "no potential acquirer" could have accepted them. But he said he would be "highly interested" if the book business was put up for sale without the conditions. Earlier, HMV had announced one of the consortium's backers had pulled out. It told the stock market it had been notified that Lazard Private Equity partners had withdrawn support for the Waterstone's bid. If successful, the bid would have seen Mr Waterstone become the firm's chairman, with former Penguin UK head Anthony Forbes Watson taking over as chief executive. The conditions imposed by HMV included the consortium having to complete due diligence - background checks on company records - within 14 days. HMV could also have terminated the bid at any time - with the consortium being barred from a future offer for one year. "No potential acquirer could reasonably have accepted these conditions," Mr Waterstone said. "However, we believe the financial logic for the group to sell the book business is demonstrably clear, and if these assets should be put on the market without penal preconditions to due diligence, then we would remain highly interested." However, this version of events is disputed by HMV. An HMV company spokesperson said that there were no discussions held about the confidentiality agreement which had been forwarded to their advisory team last week. "It was a standard agreement for mergers and acquiistions and they made no attempt to negotiate on it," she added. The consortium's offer had been conditional on HMV not buying - or offering to acquire - rival bookstore chain Ottakar's. In 2005, HMV made a £96.4m offer for Ottakar's, which lapsed following a referral to the Competition Commission. Since then, however, the commission has given its provisional approval to the potential merger, and HMV is awaiting a final ruling before deciding whether to bid again. HMV's interest sparked criticism from the publishing industry, with some arguing that if the deal went ahead it would restrict choice on the high street. However many independent booksellers believe they offer customers something different and that an enlarged Waterstone's would have little effect on their business. 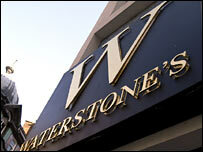 Mr Waterstone founded the book chain in 1982, with a store on London's Old Brompton Road. It now has more than 200 branches. In March, private equity firm Permira abandoned a £842m bid for HMV after the chain turned down the approach. The offer was Permira's second bid for HMV. A £672m offer was rejected in February.